The Israeli occupation forces (IOF) on Thursday morning kidnapped a Palestinian youth from southern Nablus after they aggressively beat him. Eyewitnesses told the PIC the IOF soldiers stopped a car driving near a flying checkpoint set up on the main access road to Jama’in town, south of Nablus, and forced a Palestinian youth out of the car. The detainee, who is reportedly a native of the nearby Ourif town, tried to flee but was chased down and violently beaten by the Israeli soldiers. 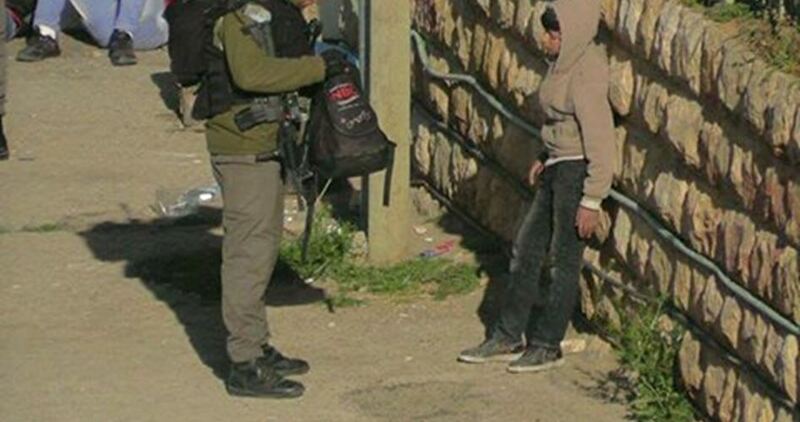 The Israeli Occupation Forces (IOF) arrested Thursday morning a Palestinian child at a military checkpoint near the Ibrahimi Mosque in al-Khalil. The PIC reporter quoted eyewitnesses as saying that the 16-year-old boy Ahmed Ghaith was arrested while passing at Abu Rish military checkpoint for allegedly having a knife in his possession. The schoolboy was taken handcuffed to unknown detention center, the sources added. An Israeli settler was killed, and another suffered mild wounds, Thursday, in what Israel called a deliberate ramming attack, carried out by a Palestinian driver, who was detained at the scene, at the junction of Ofra illegal Israeli colony, east of Ramallah, in the occupied West Bank. 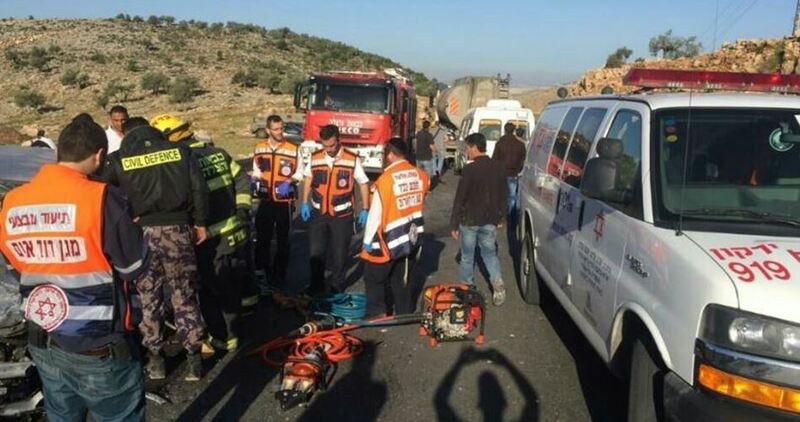 Israeli medics rushed to the scene, but were unable to revive one of the wounded Israelis, approximately 20 years of age, and provided first aid to the mildly wounded Israeli, 19 years of age, before moving him to a hospital. Their names have not yet been released. Israeli daily Haaretz quoted an emergency medical responder stating that the Palestinian drove his car into a group of soldiers standing near the bus stop, adding that security poles, that were installed by the army after a previous similar incident, protected Israelis who were waiting for the bus from being hurt. The Palestinian was detained at the scene, and was instantly moved to a military interrogation facility. Following the incident, dozens of Israeli colonists closed main road near Ofra to all Palestinian traffic, and prevented them from driving through, while Israeli soldiers stood nearby without attempting to remove them. Israeli soldiers abducted, on Thursday at dawn, two former political prisoners from their homes in Beit Ummar town, north of the southern West Bank city of Hebron, and summoned four Palestinians for interrogation. The soldiers invaded Beit Ummar from several directions, before storming homes and violently searching them, and abducted two former political prisoners, identified as Ahmad Yousef Ekhlayyel, 28, and Issa Ali Awad, 27. 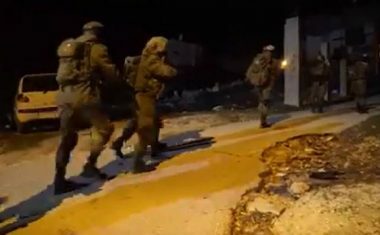 The soldiers also invaded and ransacked homes in the center of the town, in addition to Beit Za’ta area, and summoned many Palestinians, including an elderly man, for interrogation at the Etzion military and security base, north of Hebron. 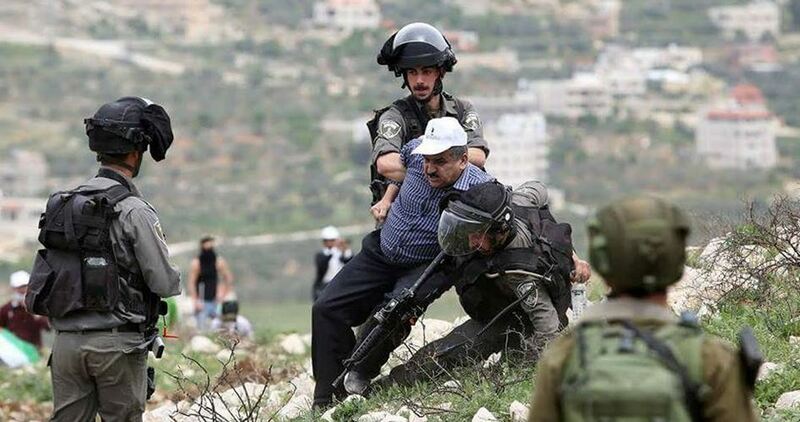 The summoned Palestinians have been identified as Yousef Hasan Ekhlayyel, 64, his sons, Aktham, 25, and Karam, 18, in addition to Hammad Ahmad Abu Mariya, 26. Clashes also took place between the invading soldiers, who fired many gas bombs and concussion grenades, causing many residents to suffer the severe effects of teargas inhalation, and local youths, who hurled stones at the military vehicles. 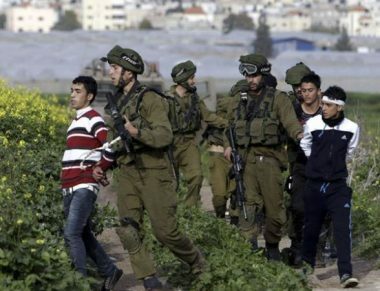 Israeli soldiers abducted, on Thursday at dawn, three Palestinians from in Azzoun town, east of Qalqilia, and one in Tal village, south of Nablus, in the northern part of the occupied West Bank, and took them to detention and interrogation centers. The Qalqilia office of the Palestinian Prisoners Society (PPS), has reported that the soldiers invaded and violently searched homes in Azzoun town, east of Qalqilia city, and abducted two Palestinians, identified as Ayyoub Farouq Abu Haniyya, 27, and Qais Waddah Shbeita, 22. The soldiers also installed a sudden military roadblock at the main entrance of Azzoun, and abducted Ala’ Mos’ab Radwan, 22, while he was returning home. Radwan is an Engineering student at the Najah National University in Nablus. 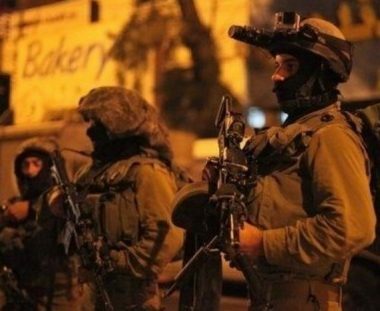 Furthermore, the soldiers invaded Tal village, south of Nablus, searched homes and abducted a young man, identified as Izzat Mohammad Ramadan, 28. 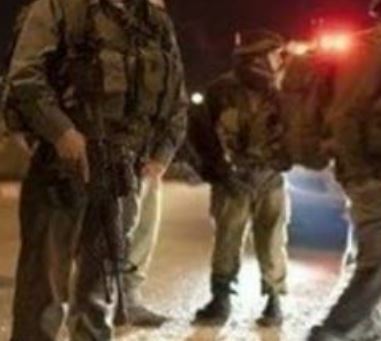 Israeli soldiers abducted, on Thursday at dawn, three Palestinians in the West Bank governorate of Bethlehem, and one in Jenin, in the northern part of the occupied West Bank, after breaking into their homes, and violently searching them. 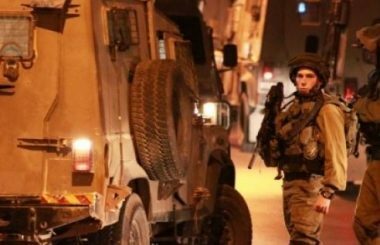 The Bethlehem office of the Palestinian Prisoners’ Society (PPS) said several army vehicles invaded Za’tara village, east of Bethlehem, and abducted Ahmad Za’al Sahouri, 23. 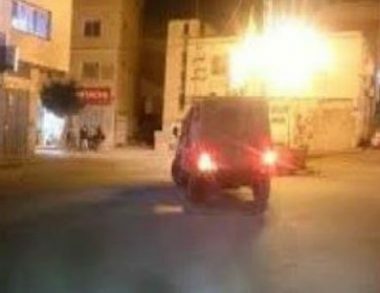 It added that the soldiers also invaded the al-Khader town, south of Bethlehem, and abducted Marwan Hussein Issa. The soldiers also abducted a lawyer, identified as Hussein Mahmoud Sheikh, 34, from his home in Marah Rabah village, south of Bethlehem. Furthermore, dozens of soldiers invaded Jenin refugee camp, in Jenin city, in the northern part of the occupied West Bank, and abducted Islam Ali ‘Azayza, 21. 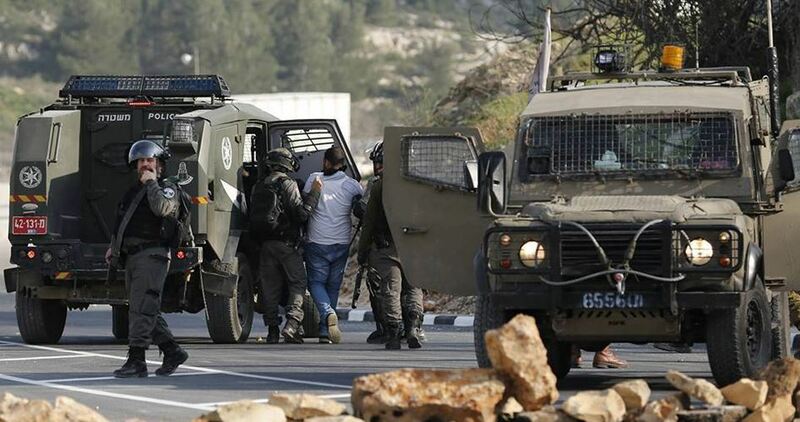 Israeli soldiers invaded, on Thursday at dawn, several homes in different parts of Tulkarem governorate, in the northern part of the occupied West Bank, and abducted six Palestinians, after invading their homes and violently searching them. The Tulkarem office of the Palestinian Prisoners’ Society (PPS) said the soldiers invaded and ransacked many homes, in various communities in the district, including in Tulkarem city, interrogated many Palestinians while inspecting their ID cards, and abducted six. 1. Hani Adel Omar, 22, from Far’un village, south of Tulkarem. 2. Ismael Ezzat Jaber, 24, from Nour Shams refugee camp, east of Tulkarem. 3. Ramez Abdul-Hakim Oleyyan, from Nour Shams refugee camp, east of Tulkarem. 4. Emad Mahmoud Masharqa, 30, from Nour Shams refugee camp, east of Tulkarem. 5. Ahmad Al-A’raj, 26, from Thannaba area, east of Tulkarem. 6. Bassam Mer’ey, 46, from Thannaba area, east of Tulkarem. 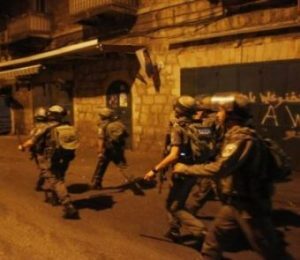 Undercover Israeli soldiers abducted, on Wednesday evening, two young Palestinians in the al-‘Eesawiyya town, in occupied East Jerusalem, after the soldiers invaded homes and clashed with local youngsters. Mohammad Abu al-Hummus, a member of the Follow-Up Committee in al-‘Eesawiyya, said the soldiers invaded the center of the town, especially Oleyyan and Mheisin neighborhoods, and clashed with local youngsters, who hurled stones on them. Abu al-Hummus added that the soldiers fired many live rounds, rubber-coated steel bullets and gas bombs, before undercover officers infiltrated into the town and abducted two young men, identified as Mohammad Ahmad Obeid and Nimir Nasser Mahmoud. The soldiers also fired rubber-coated steel bullets at several homes, causing damage. A Palestinian youth allegedly recruited by Hamas to promote anti-occupation attacks in Israel was charged at the end of March by an Israeli military Court, the Shin Bet (Israel Security Agency) said, officially clearing for release information about the suspect on Wednesday. According to the Jerusalem Post daily, Qalqilya resident Malak Nazar Kazmar, 23, was arrested in a joint manhunt by Shin Bet and the army on February 26 2017. 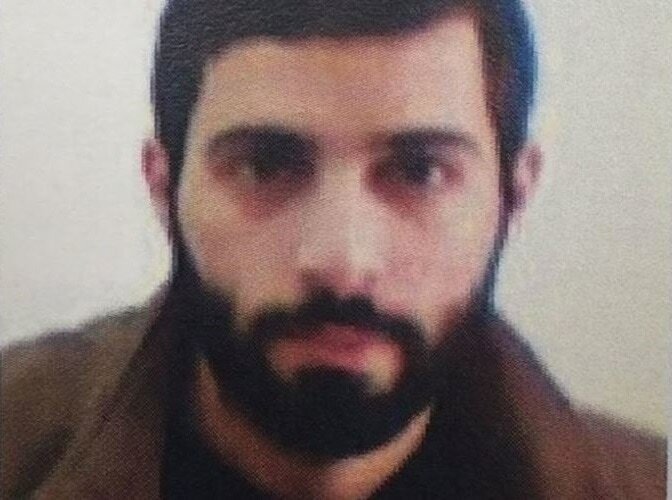 The Shin Bet claimed that Kazmar, who had lived in Turkish Cyprus for the last few years, had been recruited by Hamas while he was in Jordan in August 2015 and sent to a training camp in Syria’s Idlib province in January 2016. In the training camp Kazmar learned to shoot and underwent theoretical training on the production of explosive devices. In January 2017, shortly before he returned to the occupied West Bank, he met with Hamas operatives in Istanbul who instructed him to recruit additional Hamas operatives who lived in Israel, according to the same source. Kazmar was arrested on his return to the West Bank, before he could carry out the instructions he was allegedly given to try to find potential activists who could join Hamas ranks. The Israeli Occupation Forces (IOF) brutally attacked three Palestinians during their arrest, the Palestinian Prisoners Society (PPS) revealed Wednesday. Following her visit to Etzion detention center, the PPS’s lawyer Jaklin Fararja affirmed that the detainee Ibrahim Abu Daya, 24, was violently attacked and beaten during his arrest and investigation process. Montasser Abdelhamid Za'eig, 24, was also attacked while being arrested and taken in a military jeep, while the detainee Saber Yahya Amour, 23, was violently beaten by Israeli forces during his arrest from his house in Takoa town, south of Bethlehem. The three detainees were all arrested on April 2. Since the outbreak of the Jerusalem Intifada in Oct. 2015, at least 2,600 Palestinian children have been arrested in Israeli military detention centers notorious for the systematic ill-treatment and torture of Palestinian children, rights sources revealed. 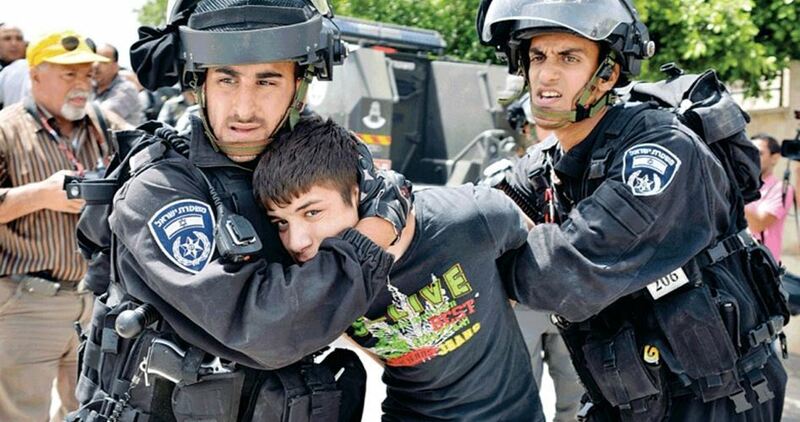 The researcher in prisoners’ affairs Riyad al-Ashqar pointed out, in a new report marking the International Child Day, that 320 Palestinian minors are currently held in Israeli custody amid unbearable detention conditions, denied from their basic and fundamental human rights. Al-Ashqar reported different human rights violations against the detained children including night arrests, brutal assaults, severe beating, violent interrogation techniques, ill-treatment, threats, psychological and physical torture, extracting forced confession, and banning family visits. He also noted that Israeli arrest campaigns against Palestinian prisoners have been notably escalated since the outbreak of Jerusalem Intifada. Hundreds of them were held in different detention and investigation centers, mostly in notorious Etzion detention center. 17 Palestinian minors were detained after being injured during their arrest, some of whom were transferred to prisons without any medical care or treatment, he said. According to the report, Palestinian detained children are brought to court not accompanied by a parent and are generally interrogated without the benefit of legal advice. They are overwhelmingly accused of throwing stones and alleged stabbing attacks, an offense that can lead to a potential maximum sentence of 10 to 20 years. Israeli soldiers invaded, Wednesday, several Palestinian homes in different parts of occupied East Jerusalem, violently searched them, and abducted four Palestinians, including the father of a young man who was killed earlier this year. The soldiers invaded homes in Silwan town, south of the Al-Aqsa Mosque, and abducted a young man, identified as Khaled az-Zeer, before moving him to an interrogation center. Furthermore, several military vehicles invaded Qalandia refugee camp, north of Jerusalem, also searched homes, and abducted ‘Ayed Abu Ghosh, Salim Abu Ghosh and Salem Abu Ghosh. It is worth mentioning that Salem is the father of Hussein Abu Ghosh, 24, who was killed by Israeli army fire, on January 25th 2017, after the soldiers alleged he tried to ram soldiers with his car. Israeli soldiers invaded, on Wednesday at dawn, Fahma village, south of the northern West Bank city of Jenin, violently searched homes and abducted three Palestinians, including a local lawyer whose car was also illegally confiscated. The soldiers also invaded Tulkarem refugee camp, and abducted one Palestinian. The Jenin office of the Palestinian Prisoners Society (PPS) has reported that the soldiers ransacked many homes in Fahma village, and abducted Shafiq Mahmoud Sa’abna, 27, Salam Sa’abna, and lawyer Luay Ahmad Sa’abna, 35. The army caused excessive damage to the searched homes, and confiscated the car of the abducted lawyer, before moving the three Palestinians to an unknown destination. In Tulkarem, also in the northern part of the West Bank, the soldiers invaded homes in Tulkarem refugee camp, searched them, and abducted a young man, identified as Amir Srouji, 23. Also at dawn, dozens of soldiers invaded the Deheishe refugee camp, south of the West Bank city of Bethlehem, and clashed with local youths, before shooting and seriously injuring a young man, and abducted eight Palestinians during violent searches of homes, in Bethlehem district, including three in Deheishe. The Palestinian Prisoners Society (PPS) in Bethlehem, has reported that the number of Palestinians, abducted by Israeli soldiers, at dawn Wednesday, in the West Bank governorate of Bethlehem, has arrived to nine, while one of them was shot and seriously wounded by army fire.It stated that the soldiers abducted Mo’tasem Raqaban, Ahmad Issa Sarrar, and Bara’ Jamil Abu ‘Alia and Ahmad Sar’awi, from their homes in Deheishe refugee camp, south of Bethlehem. The PPS further reported that the soldiers also invaded Nahhalin town, southwest of Bethlehem, searched homes and abducted five Palestinians, identified as Omran Yousef Omran, Ibrahim Waleed Najajra, Adel Mahmoud Ghayatha, Abdul-Karim Shakarna, and Akram al-Atrash. It is also mentioning that the soldiers shot al-Atrash with three live rounds in his back and shoulder, seriously wounding him, before local medics moved him to Beit Jala governmental hospital. In related news, the soldiers invaded Fahma village, south of the northern West Bank city of Jenin, violently searched homes and abducted three Palestinians, including a local lawyer whose car was illegally confiscated. The soldiers also invaded Tulkarem refugee camp, and abducted one Palestinian. Israeli soldiers invaded, on Wednesday at dawn, the Deheishe refugee camp, south of the West Bank city of Bethlehem, and clashed with local youths, before shooting and seriously injuring a young man, and abducted eight Palestinians during violent searches of homes, in Bethlehem district, including three in Deheishe. The soldiers fired many live rounds, wounding a young man, identified as Akram Omran al-Atrash, 23, with three live rounds in his back and shoulder, seriously wounding him, before local medics moved him to Beit Jala governmental hospital. His cousin, lawyer Farid al-Atrash, said the hospital is currently conducting all needed arrangements to move him to Hadassah Hospital, in Jerusalem, due to the seriousness of his condition. The soldiers also invaded and ransacked several homes in the refugee camp, and abducted Ahmad Issa Sarrar, Ahmad Sar’awi, 22, and Mo’tasem Mazin Raqaban, 23. 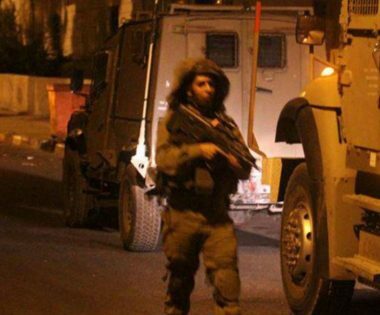 Furthermore, the army invaded Doha town, west of Bethlehem, searched homes and abducted Bara’ Jamil Abu ‘Alia, 21. 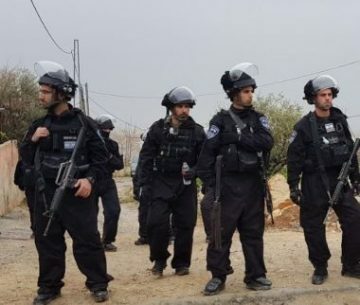 In addition, the army invaded Nahhalin town, west of Bethlehem, also searched homes and abducted four Palestinians, identified as Ibrahim Waleed Najajra, 20, Omran Yousef Najajra, 21, Adel Mahmoud Ghayatha, 16, and Abdul-Karim Mohammad Shakarna, 20.